Kurizambutto has emerged as a gallery which playfully explores today’s means of communication, institutional critique, the reproduction of aesthetic effects, and various elements and vices related to art. Above all, it aims to reveal the neo-conceptual mannerism which shapes “the contemporary” and how it is ruled by the market, the elites, and its peripheral fauna. It is a simple and open provocation against the channels through which art is legitimized and sold. A biting commentary about how art today is produced, justified, legitimized, sold and consumed. A series of simulations. 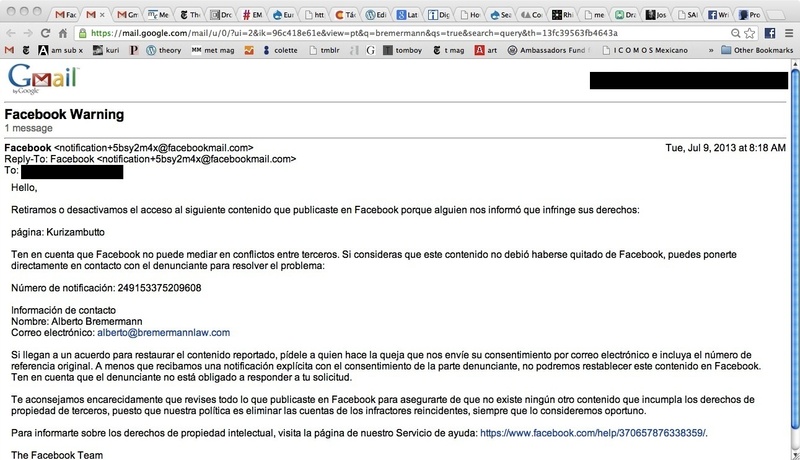 Kurizambutto was a Facebook page that functioned from 18 January to 9 July 2013 – it engaged in radical art criticism of the Mexican art world, its figures and corrupt practices. It ruthlessly poked fun at Mexican contemporary artists and institutions by using the figure of the on-line troll as inspiration. The main institution that was mocked was Kurimanzutto, the gallery which represents Gabriel Orozco. It was shut down by a Mexican lawyer, Alberto Bremermann, due to alleged copyright infringement. Other than the fact that appropriation, or the use of other images to create new works of art has been a common practice in art since at least the 80s (Sherrie Levine, anyone? ), neither of the page’s managers have made money from the page itself. Is this how things are run in Mexico? Lawyers help others shut down on-line criticism? Isn’t it interesting that all this happens while the art world gushes about Mexico City’s rise as a contemporary art hotspot? The first image that was taken down due to ‘copyright infringement’ compared a work by Gabriel Orozco to one by Goya. 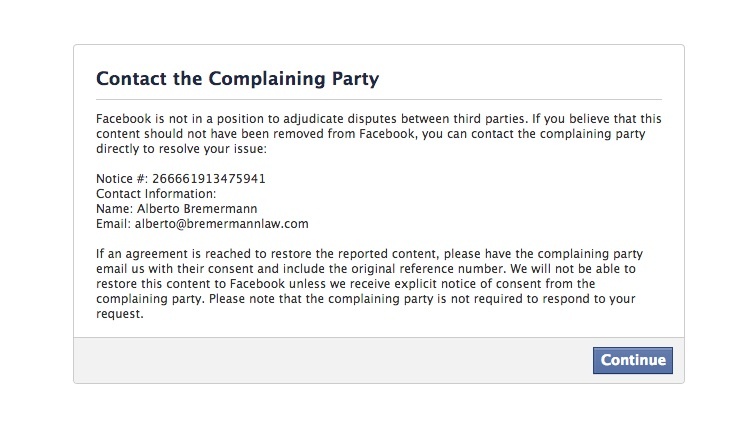 The page was shut down the next day and cannot be recovered unless the lawyer Bremermann decides to reactivate it. The following timeline explains Kurizambutto’s life and development, which was full of sarcastic jokes, trolling, and pranks. 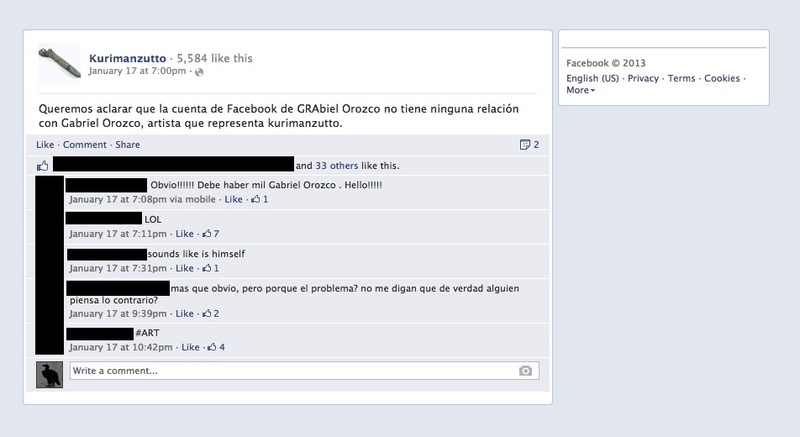 November 2012: An artist based in Mexico City creates a ‘mock’ Facebook profile named Grabiel Orozco, a parody of Mexico’s most famous living artist. The profile accrued about 900 friends. No images of works by the real Gabriel are uploaded. Despite the different spellings and the found images that are uploaded, even famous Mexican artists and curators fell for the prank. GRabiel Orozco revealed what everyone knows – the Mexican art scene functions through nepotism; people were seduced by this ‘closeness’ to power, money and glamour. 17 January: Kurimanzutto (Orozco’s gallery) denounces the profile as fake. The profile is reported and taken down by Facebook. 18 January: An art historian joins the project. 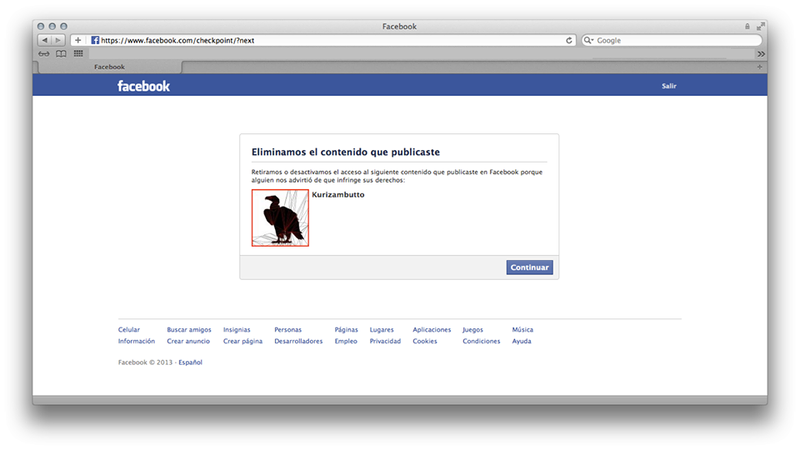 Kurizambutto (a name that mocks the Orozco’s gallery, Kurimanzutto) is created as a Facebook page. Regardless, many posts and images are reported and blocked. Originally, the project functions as an anonymous page. They are accused of trolling, copyright infringement, cowardice. April 2013: Kurizambutto’s exhibit in Mexico City at an independent arts space is cancelled with no warning or excuse. Kurizambutto’s website is shut down at Wix due to accusations of alleged copyright infringement. No images of art were included, only of found images which were SIMILAR to real artists’ works. No real artist’s names were used in the page. [Dear kurizambutto, As a follower of the thread Someone erased my site! How can I get it back? Please, here is Paola’s last answer. July 8: An image is taken down due to copyright infringement. It was a side by side comparison of a work by Gabriel Orozco with one by Goya. The accusing lawyer is Alberto Bremermann, specialized in art law and copyright. 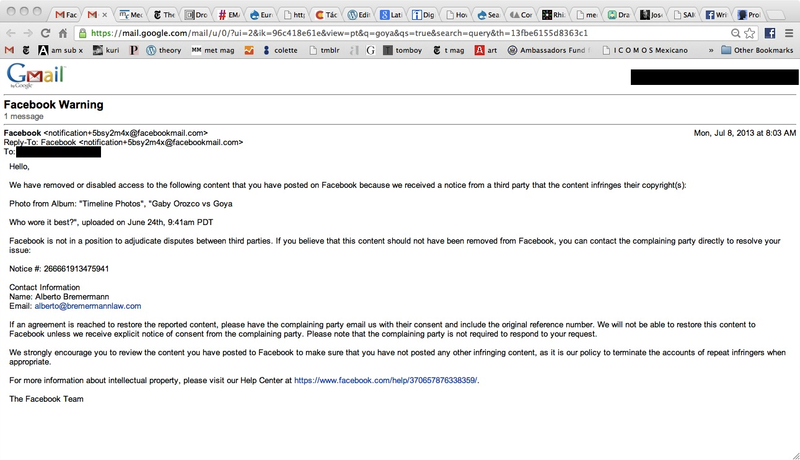 July 9: Kurizambutto’s page is blocked by Facebook due to an alleged copyright violation. July 18: Kurizambutto BACK, the replacement page, closes for good. The project was supposed to last six months to begin with; it is accessible to everyone but no more content is added. None of the administrators has profited financially from either page. Is Alberto Bremermann using copyright as an excuse to censor a project he and his friends dislike??? If there are some copyright issues, how come he has yet to contact the administrators? We ask that you spread the news that a net art project was shut down by the lawyer Alberto Bremermann for no reason other than he disliked the content. NOTE: ArtLeaks has contacted Mr. Alberto Bremermann at the beginning of August 2013 and asked him to express his official position regarding this case. Mr. Bremermann has engaged with us in a private correspondence, but has not provided an official statement until now.